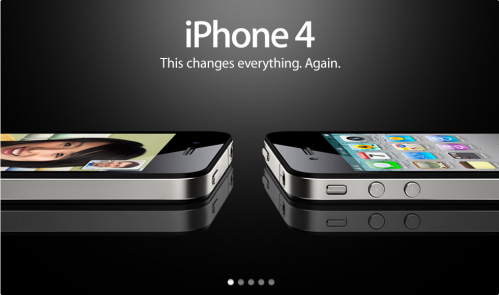 WebOffspring » iPhone 4 announced! What we didn’t already know! iPhone 4 announced! What we didn’t already know! What a buzz the new iPhone 4 has made! The crowds are yelling!! Give it to us!!! Give it to us!! Not yet guys… In US you should wait a little longer till June 24… Rest of the world…. mid Summer. But what was announced yesterday in Apples’s WWDC that we didn’t already know from the infamous Gizmodo leak last month? We sure have seen the thing before! But now we know it IS the real thing. It IS the final and not a prototype design. I won’t go on listing all the phone’s features… There are all over the web… and if you want some help finding them Gizmodo has iPhone 4: The Definitive Guide, Engadget announces it here and if you want the standard marketing stuff (with a lot of extra info as a plus) head to the “mothership”. So whats new? What we didn’t know till yesterday? A new glorious Screen! This is huge! From what I hear is almost like you read a printed book! Great for photos, great for videos! 326 pixel per inch! This is higher than a printed magazine page! Imagine that! Some comments on the display around the net… “It looks insane in person!”, “Ubelievable”! Again… Great feat! Not that the current 3GS model is thick but this one is a lot better! 9.3mm better in comparison to the 12.3mm of the 3GS. Actually the improvement is not great in terms of talk time (2 hours) and non existent in Stand By time (300h), but then again the new display should be juicing out a lot more power. The iPhone can now “sense” movement around 6 axis! This is going to bring into the game a whole new breed of apps and games I think! The focus is in picture quality and not mega pixels count. The sensor has a higher ISO sensitivity and it sure captures magnificent photos judging from the samples. A LED flash is available that doubles as a light for video shots. Yeah baby! Combine this with iMovie and you ‘re done! The app demo during the keynote was just impressive! It resembles the full iMovie experience except from the smaller screen. Despite the not so intuitive name the app is cool. It only supports WiFi calls though and iPhone 4 to iPhone 4 calling only. It is very well implemented, in all Apple simplistic glory, and it may actually be used more than other similar features on smartphones in the past, considering that you are not going to be charged for the call since you are using WiFi. It was a little bit awkward to say that all those iPads out there run a phone OS, wasn’t it? Problem fixed! Hundreds of new features software wise are unveiled by the OS roll out… Available on most iPhone’s out there in a few days… not only iPhone 4… ! – No physical camera zoom! Ok, ok… i know its not an actual camera and its so thin and all… but wouldn’t it be nice? – Syncs with iTunes! Never liked that one! –Should I Buy an iPhone 4? iPhone OS 4 is coming soon to an iPhone near you! The most convincing iPhone 4G mock-up or the REAL thing? IPhone and iPad will never support Flash! True Story! The new iPhone 4G in photos! Nikos is a Web Developer and Consultant and has put many years of work on web technologies. His interests lie in the Content Management, eCommerce and Web Publishing area. He's been involved in the development of numerous big sites and projects back in his home country, Greece, and in the design and implementation of several Web applications. Nikos has written 44 awesome articles. The iPhone 4 really takes everything a step further. Finally there is a big change in the iPhone series and it has great specs. The only downside are the 32GB, I wish there would be a 64GB version.